Hermann, Mo. 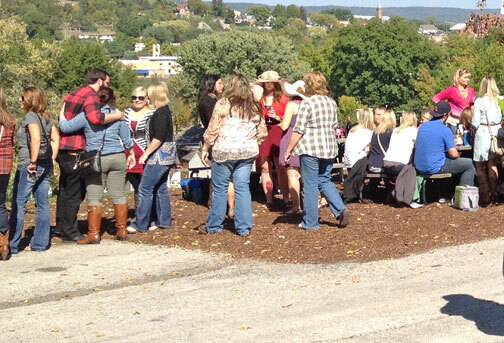 - Stone Hill Winery is one of the most popular wineries for bachelorette parties. 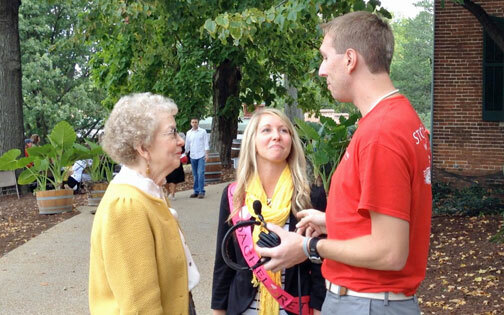 During our interview with Betty Held, who founded Stone Hill Winery with her husband Jim, while talking with her about Oktoberfest at Stone Hill Winery, she shares a little advice with one soon to be bride. 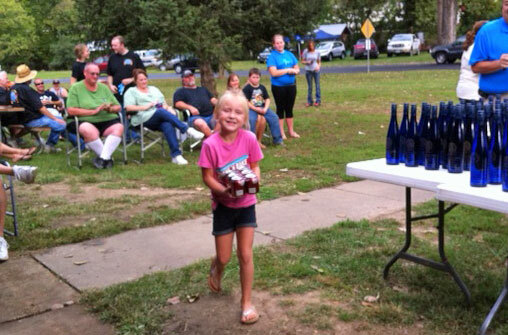 Watch this neat moment during Oktoberfest at Stone Hill Winery below. It is rockin' at Stone Hill Winery and later we will be watching the St. Louis Cardinals on a big screen set up down in the pavillion. Hermann, Mo. 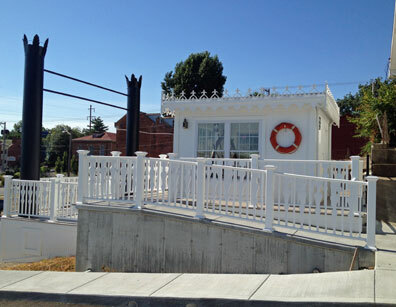 - On Friday, October 11, 2013 at 5:00PM a group of the volunteers who assisted with the rebuilding of the Hermann River Memorial and the creation of the Gerald Engemann Memorial Garden will celebrate the completion of the task. The public is invited and encouraged to attend. “We started the job and now we are complete” said Carol Kallmeyer of Historic Hermann. “There may be some additions but the original plans have been met which really is a good is feeling”. The original Hermann River Memorial was removed with the construction of the Christopher Bond Memorial Bridge over the Missouri River in Hermann. Pictured is Tatum Scheer of New Haven, Mo. Champion of the Youth - 5-10 divison. Hermann, Mo. - The Hermann Area Chamber of Commerce had a very successful re-launch of the Kansas City Barbeque Association sanctioned (KCBA) BBQ & Brats event with over 40 participants and a great response by all who participated. Parent Training & Information presents Solving the Journey to Adulthood. This workshop provides basic information and strategies to help parents begin a discussion about this important but often uncomfortable topic with their sons and daughters. As the sun began to set, white flashes of light began firing with spectators all trying to capture the breathtaking view of six balloons lighting up the nighttime skies. New Haven Chamber Kicks Off Saturday With Parade - Food And Games In Park Starting At 1 p.m.
Interactive or download Parade route map below. Use your smartphone and get custom directions. New Haven, Mo. - The New Haven Area Chamber of Commerce is gearing up for the 2013 Balloon Festival, held in conjunction with the 24th annual Pepsi Hot Air Balloon Race on Saturday, September 28. The event is free and open to the public. 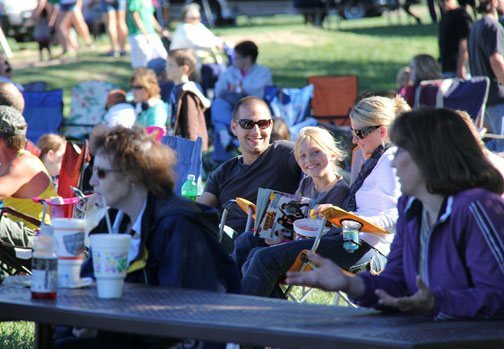 Read more about New Haven Chamber Kicks Off Saturday With Parade - Food And Games In Park Starting At 1 p.m.
New Haven, Mo. 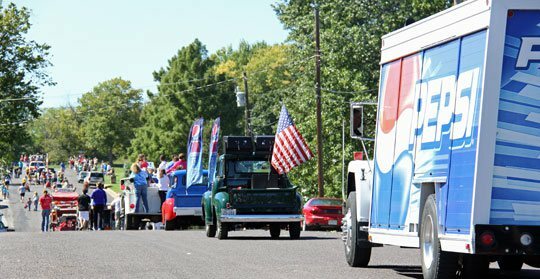 - Saturday will mark the 24rd Annual Hot Air Balloon Race presented by Pepsi. Despite last year's near perfect weather the winds won, but this year everyone is hoping mother nature will be a little nicer. Missouri weather is unpredictable and forecast's you see on TV are not specifically for New Haven. However, our good friends at ABC17 and Meteorologist Neville Miller is putting together his forecast specifically for New Haven and what we can expect for Saturday's Hot Air Balloon Race. Easily access all Balloon Race Information no matter where you are at right here on QuickNewsNow and on Saturday pull out your smartphone to know exactly what time the balloons will launch. Visit our Race Information Center if you have any questions or more details about Friday and Saturday's events.